This is beginner’s guide to sentiment analysis using Python NLTK on windows. 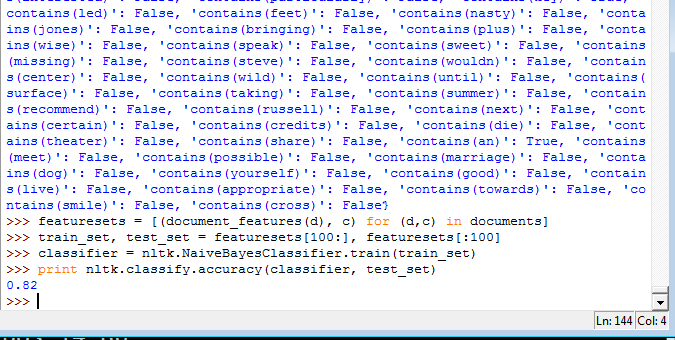 We’ll start w/ installing Python and NLTK and then see how to perform sentiment analysis. 1. Search for python 2.7.3 for windows and install it. 2. Search for Python setup Tools for Windows and install it. 3. Install PIP (for win 64 bit), NLTK and PyYAML. in the new window that opens, install the movie_reviews corpus. In this post, we learned how to perform sentiment analysis using Python on windwos platform. NLTK supports classifiers other than Naive Bayes, and also there are resources that will help you increase the accuracy of the classifier. And I hope that this post acts as a starting guide for you!